Yoga students seeking individual tuition are invited to book in for one-on-one yoga classes with certificated Yoga teacher. Yoga’s private sessions will take your health and practice to the next level. Private class is taught according to your needs (whether you are healthy or suffer from back pain, headache, insomnia, depression, obesity or you have stiffened or weak musceles etc. ), any time, that is appropriate for you. Feel free to contact us to schedule an appointment. Teaching in Czech as well as in English language. You’ll find a warm and inclusive atmosphere in our studio. 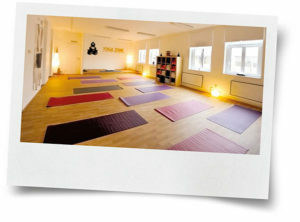 Great space 130 square metres for private or open yoga or pilates classes (fully equipped with the yoga props) as well as for the workshops. Maximum capacity is 18 people.